Nova Scotia is one of the Atlantic Provinces of Canada. It includes a large peninsula and Cape Breton Island which is connected to the mainland by the Canso Causeway. Halifax is the capital city in Nova Scotia, which is where you'll find about 44% of the province's population. Many people visit the area for it's scenic beauty, rich history, and excellent seafood. There are a handful of hostels throughout Nova Scotia. The highest concentration is found in Halifax, but you'll find several others in small towns throughout the province. How much do hostels in Halifax cost? A party hostel in Halifax that is good for backpackers and small groups. Halifax Backpackers is located in the middle of North End Halifax. It's a small, independently owned hostel that embodies the personality of the city. It's located to the north of the downtown area and is just a five minute walk from the waterfront. This is a fun and diverse hostel that is surrounded by live music venues and second hand stores. It's a great value and a fun place to stay if you're hoping to take advantage of the city's nightlife. The hostel also offers all kinds of free amenities including linens, wi-fi, and travel information. There's also an on-site organic fairtrade cafe and a book exchange. Halifax Backpackers has a social environment where it's easy to meet other travelers. During the summer months they host regular barbecues and frisbee nights. Between the months of October and May there are Reggae dance nights and DJs in the cafe on the weekends. Parties last until 2 am so if you're planning to go to bed early, this is probably not the place for you. Guests can choose between private rooms and dorm rooms, all of which are reasonably priced. A good hostel in Halifax for backpackers and solo travellers. 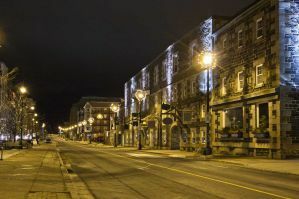 HI Halifax is located right in the heart of Halifax's downtown. It's located in a 160 year old building that has a lot of character, and it's about 200 meters from the bus and train stations. The hostel is close to many of the city's best music venues and pubs. It's also just a two minute walk from the Harbour Front/Boardwalk and is near some great seafood restaurants. Also nearby is the weekend Farmer's Market and various specialty shops. The hostel has all kinds of amenities available for guests. There's a well equipped kitchen that guests can use to prepare their own meals, and there are several large grocery stores nearby where you can pick up food and supplies. The hostel also has coin operated laundry, internet access, and free wi-fi throughout. There are both private rooms and dorms available and dorms sleep up to six people with male only, female only, and co-ed rooms all available. A good hostel in Digby by the Bay of Fundy. Digby Backpackers Inn is a small and welcoming hostel that is located in the heart of Digby on the Bay of Fundy. The Bay of Fundy is famous for having the highest tides in the world. The hostel is just a short walk from the boardwalk and fishermen's wharf and there are some great restaurants nearby where you can try the area's famous lobster and scallops. Digby Backpackers Inn has a lot of amenities for guests. There are comfortable beds, a large living room, a barbecue area, fire pit, and a garden where you can relax after a busy day exploring the area. There's also a basic breakfast included in the price of the room. If you want to prepare your own meals, there's a large, fully equipped kitchen available to guests. This is a great place to base yourself near the Bay of Fundy. It's a good value and is very accessible to many of the area's great day trips. It's also a fun setting where you can meet other travelers. A great hostel on Cape Breton Island for solo travellers, couples, and families. Bear On the Lake Guesthouse is a top rated hostel for travelers to Canada. It's located on Cape Breton Island and it is a great base for exploring the Cabot Trail and Cape Breton Highlands National Park. The hostel has a relaxed environment where you can sit back with your map and plan your adventures. The staff are readily available with all kinds of tips and advice. In the area you'll find all kinds of activities that you can enjoy. There's hiking, sailing, kayaking, whale watching, music events and more. This hostel is really a great place to relax. There are hammocks and a barbecue area and there are often campfires where you can roast marshmallows by the lake. You'll truly feel like you've found somewhere special. The hostel has dorms that sleep between three and five people. There are also private rooms that have private balconies and family rooms where you can have a little more space. Regardless of your budget or travel style, you're sure to enjoy your time here.